Sunday October 2nd 1898 I was busy about the work most of the forenoon. Will and I were here alone. I wrote part of the afternoon was down to Johns for a short call. Wrote more in the evening. I got six letters ready to mail. Monday October 3rd 1898 We did a big washing in the forenoon worked with the fruit what time we had to spare, was busy all day. Tuesday October 4th 1898 Did more washing this morning of spreads and bedding finished ironing by the middle of the afternoon and worked some with grapes. another very busy day. Wednesday October 5th 1898 Will and I went up town early this morning and was over the river. Harry Briggs came home with us. I got peaches and Pink and I worked all afternoon putting them up. weather quite cool. Thursday October 6th 1898 Will put up the stove in the sitting room and we were all day sweeping cleaning and changing things about in the house. I put away a lot of my fruit in the cellar. 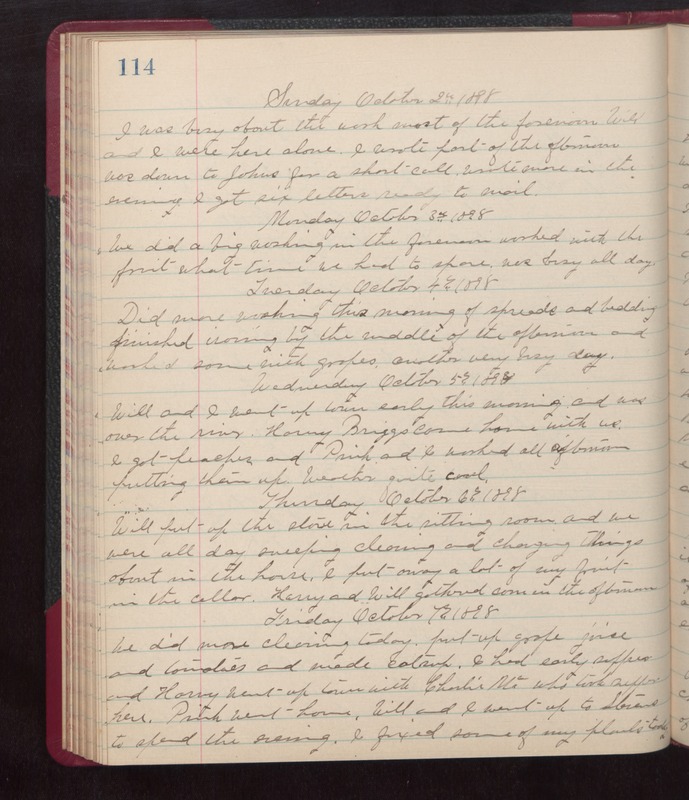 Harry and Will gathered corn in the afternoon Friday October 7th 1898 We did more cleaning today. put up grape juice and tomatoes and made catsup. I had early supper and Harry went up town with Charlie Mc-- who took supper here. Pink went home. Will and I went up to Stevens to spend the evening. I fixed some of my plants today.